The rarest gem known to man, tanzanite was discovered in 1967 in the foothills of Mount Kilimanjaro, northern Tanzania. A thousand times more rare than a diamond, this magnificent gem can only be found along a 4km strip of land in Tanzania, which is the only known source of tanzanite in the world. It is believed that within the next decade this source will be depleted, adding to the special allure of tanzanite. A variety of the mineral zoisite, tanzanite has been described as a “geological phenomenon.” It is uniquely trichroic, meaning it displays three different colours when viewed from each of its crystallographic axes, namely blue,violet and red. Once cut and polished, Tanzanite colour varies from rich royal blues to delicate shades of violet and hues of red. Its unique characteristics and exquisite beauty makes tanzanite a popular choice for a variety of different jewellery creations. The Shimansky Ayanda Queen of Tanzanite jewellery collection comprises some of the rarest and most beautiful tanzanite in the world, set in the purest South African gold. Striking treasures to be enjoyed for generations to come, each tanzanite jewellery creation is a unique celebration of Mother Nature’s rarest gift. Shimansky’s Ayanda Queen of Tanzanite collection is made up of exceptional quality certified tanzanite sourced directly from the Maasai tribe in Tanzania. Sourcing directly from Tanzania affords the unique opportunity to hand-select the most recently mined tanzanite, and to choose only the finest quality stones. Each of our tanzanite loose stones and jewellery creations are carefully selected and graded, and comes with certification that reassures the owner of the quality of the stone’s colour, clarity, cut and authenticity. The Ayanda Queen of Tanzanite collection is an exclusive range of loose quality stones and beautifully crafted tanzanite jewellery creations. Set in modern, yet timeless designs that celebrate the unique qualities of tanzanite, the Ayanda Tanzanite jewellery range is known for its unusual cuts of this precious gem. 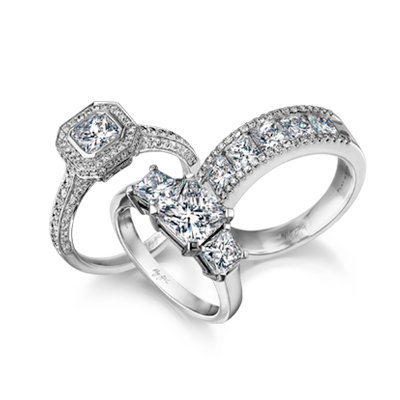 Choose from a variety of different designs, set in white gold, with or without diamonds. Bespoke tanzanite jewellery creations can also be created upon request, allowing you to own the tanzanite creation of your dreams. Available in a wide range of tanzanite rings, earrings, bracelets, necklaces and pendants, the Shimansky Ayanda Queen of Tanzanite collection is clean and contemporary, and expertly crafted in the Shimansky in-house workshop in Cape Town. Shimansky tanzanite is internationally certified in accordance with the Tanzanite International Grading Standard, so you can be assured that your stone is the rarest of the rare. Tanzanite being as rare as it is should be treated as such. Ranging between 6.5 and 7 on the Mohs scale of hardness, Tanzanite is not a gemstone we would recommend for an engagement ring or every day wear. However, perfect for an anniversary ring, dress ring, earrings or a pendant. As it is estimated that within the next decade gem-quality tanzanite will no longer be found, only those who are lucky enough to already own tanzanite now, or in the near future, will be first-time owners of the gem. Tanzanite stones and jewellery creations will become even more sought-after, and will turn into precious family heirlooms to be passed down from generation to generation. The rarity of this beautiful gem makes it completely unique and highly coveted. The world’s only truly African gem, tanzanite’s exclusive African heritage makes it a very attractive investment for those visiting the African continent. This rare precious gemstone is the birthstone for December, and is also the gem of choice for the 24th wedding anniversary. Because of its rarity and limited source, tanzanite is an immensely valuable stone. Knowing which characteristics to look out for in a tanzanite stone helps you make an informed purchasing decision. The two most important factors to consider when grading tanzanite, is colour and clarity, however, its cut and carat weight also play a significant role in its value. Many consider tanzanite to have the finest shade of blue in the world; a hue that is even more impressive than the blue of a sapphire. Good quality tanzanite has a deep royal blue or violet colour, and the more intense the colour, the more rare and valuable the stone. Tanzanite colours range from royal blues and vibrant violets to paler, watery shades. The kaleidoscope of blue and violet hues with delicate shades of red and pink truly sets this gem apart. Just like diamonds and other natural gems, tanzanite may also have inclusions that influence the stone’s clarity and value. The less natural inclusions in the stone, the higher its value, and the more rare the stone. Graded in a manner similar to that of diamonds, tanzanite ranges between Internally Flawless (IF) and Included (I1-3). Shimansky tanzanite never has a lower clarity than VVS (very, very slightly included), meaning no inclusions can be seen with the naked eye. The higher the clarity, the more intense the stone’s fire and brilliance. It is extremely important that tanzanite be well cut, not just because it gives the stone more brilliance, but also because it has a big impact on the overall value. Tanzanite must be cut to emphasise and maximise its beauty. A poor cut can make even the highest quality tanzanite look inferior. Tanzanite stones are cut in many of the popular shapes usually associated with diamonds, however, the most popular cuts for tanzanite are cushion, trilliant, pear and oval. At Shimansky we have a wide range of tanzanite cuts available, each one determined by the individual stone’s unique characteristics. The Shimansky Ayanda Queen of Tanzanite earring, ring and pendant collection is known for its top quality, certified tanzanite with superior cuts and contemporary designs.